The quadrature reflection phase shifter is shown below and is described further on this page. Here an equal-split quadrature coupler divides the input signal into two signals 90 degrees out of phase (the definition of "quadrature" is two signals 90 degrees apart, click here for more info on quad couplers). These signals reflect from a pair of switched loads, and combine in phase at the phase shifter output, as long as the loads are identical in reflection coefficient (both magnitude and phase). Unlike the loaded line structure discussed previously, the quadrature phase shifter can be used to provide any desired phase shift. Ideally, the loads should present purely reactive impedances, which can range from a short circuit to an open circuit or anything in between. This structure provides a bandwidth of up to an octave, depending on the bandwidth of the quadrature coupler itself. The coupler can be a Lange or a box hybrid on microstrip, or an overlay coupler in a stripline circuit. The size of a quadrature phase shifter is directly related to the frequency band of operation, as the coupler typically uses one or more quarter-wave sections. 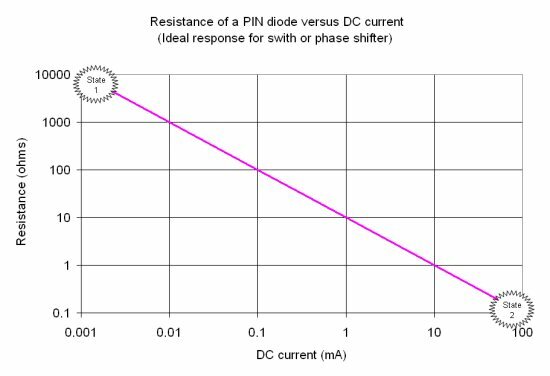 Only one control signal is required for a quadrature phase shifter, since the loads can be DC controlled simultaneously. Below are the two states that a PIN diode provides to effect a reflection phase shifter (the same two states that are used in PIN diode switches). Note that both states have high reflection coefficients (poor return loss). Ideally they would be perfect open or short circuits, and reflect 100% of the incident power, at phase angle 180 degrees apart (left and right side of the Smith chart). There are many uses for the quandrature reflection phase shifter architecture, it is possible top make bits smaller than 180 degrees, and even make multi-bit phase shifters.